Sixteen-year-old Amber never expected to find romance while working in an old-people’s home. . .but then Jack Chant is not what she expected either. He’s young, exciting and enigmatic – and deeply troubled by something that happened in the past, something that he can’t quite remember. Gradually Amber suspects that Jack’s past might be a whole lot further back in time than he realises. Is he solid flesh and blood, or just some kind of dreamy fantasy? A sweetly romantic coming-of-age story in which Amber learns more than most teens about getting old, falling in love and letting go. Rosie Borella’s novel tells the story of Amber, a sixteen-year-old girl, who, undecided about her future, secures a position as a Carer working in a nursing home. Initially, I was somewhat sceptical about the appeal of a book that chooses to stray so far from the subject matter found in many Young Adult books today; and yet it is this perspective which provides a fresh uniqueness to what is otherwise a classic ‘coming of age’ story. Amber has a fractured relationship with her parents. She is too young to be respected as the adult she is evolving into, yet old enough to shoulder the responsibilities of babysitting and child care. Her lack of self-belief, coupled with an uncertainty about her future give her character broad appeal with a teenage audience. When she meets Jack Chant, a mysterious young man with an almost Edward Cullen-like appeal; I couldn’t help but be drawn into Borella’s web. Perfect for each other, I needed them to end up together. 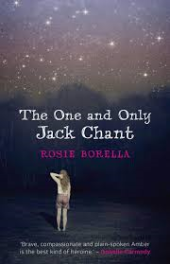 “The One and Only Jack Chant,” deals with a range of themes including the joys and sorrows of growing older, reconciling with ones’ past, the tragedy of loss, and the sweetness of first love. This text would be most appropriate for students in the latter years of high school and should work quite well as a shared text (years 10-12) although it would be well suited for independent study. It would easily pair with other Australian rural coming of age stories; specifically Steven Herrick’s “Black Painted Fingernails” or Margaret Wild’s “The Vanishing Moment”(refer to earlier reviews). As a whole, Borella’s narrative is beautiful in its pristine simplicity. Occasionally, particularly during the long dream-type sequences, I found myself a little distracted, yearning to go back to the ‘real world’ of the nursing home where Borella’s subtle humour shines through at its brightest. Borella’s story, while starting out as a Contemporary Romance, reaches into the realm of Mystery and the Paranormal. Is Jack Chant real flesh and blood, is he a convincing spectre or is he simply the product of Amber’s active imagination? An achingly beautiful romance that will have you guessing until its dramatic conclusion.